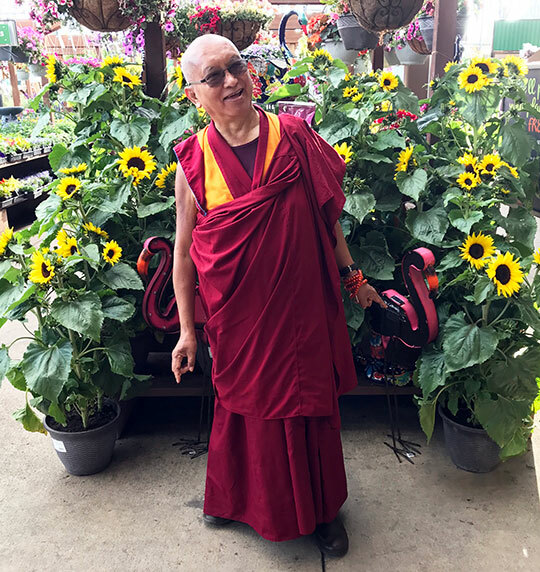 Lama Zopa Rinpoche in California, USA, June 2017. Photo by Ven. Roger Kunsang. 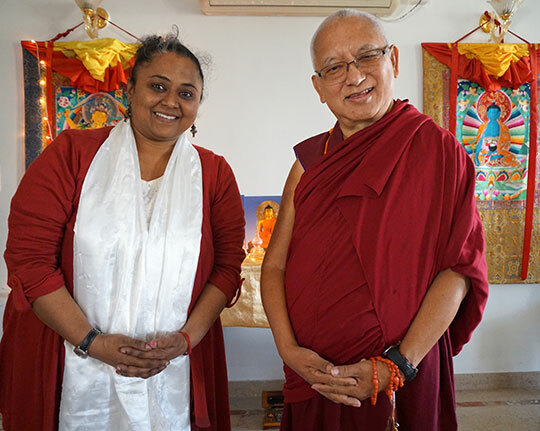 Lama Zopa Rinpoche and Deepthy Chandrashekhar, FPMT India national coordinator, Bangalore, India, December 2016. Photo by Ven. Lobsang Sherab. 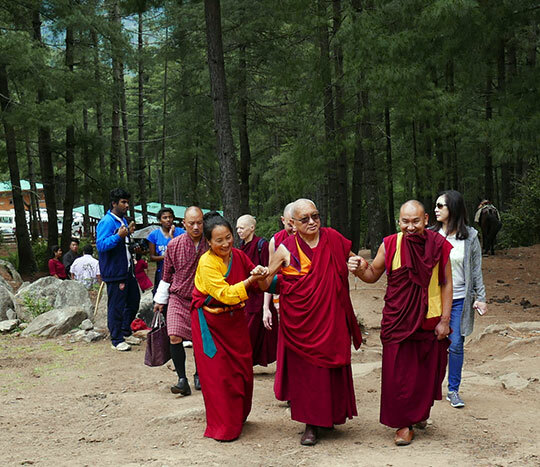 Lama Zopa Rinpoche and Khadro-la (Rangjung Neljorma Khadro Namsel Drönme) in Bhutan, May 2016. Photo by Ven. Roger Kunsang. Lama Zopa Rinpoche’s schedule for 2017 and 2018. Lama Zopa Rinpoche after blessing all beings in the ocean, California, USA, June 2017. Photo by Ven. Lobsang Sherab. 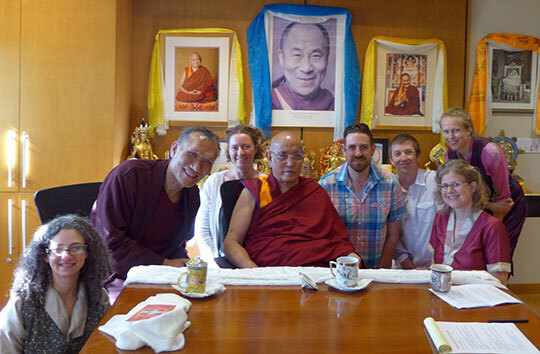 The 104th Ganden Tripa visited FPMT International Office recently during a teaching event hosted by Maitripa College. With Ganden Tri Rinpoche are Yangsi Rinpoche and some FPMT International Office and Maitripa College staff, Portland, Oregon, US, June 2017. For the last ten years FPMT International Office has been building an endowment large enough to support the long-term health of the Sera Je Food Fund, whereby the interest from the endowment would cover the annual costs associated with offering three nutritious meals daily for all the monks of Sera Je Monastery, for as long as the endowment remains. Amazingly, due to the kindness of so many generous donors, we reached our target for the endowment fund. This is an amazing accomplishment for the entire FPMT organization. As such, FPMT no longer needs to fundraise for the Sera Food Fund. We are so happy to be able to offer the entire endowment to Sera Je Monastery to administer and manage. This offering allows the monastery to be self-sustainable in the offering of food to all the Sangha studying there. In May 2017 the first installment of the endowment was transferred to the monastery and the remaining funds of the endowment will be transferred over the next few years. A BIG thank you from us to every single person who has been a part of the Sera Je Food Fund and enabled FPMT to make this incredible offering! FPMT International Office is now developing the Supporting Ordained Sangha Fund, which is not limited to any one monastery or nunnery and offers financial support to Sangha in need of food, accommodation, health care, education, and conditions for practice. In June 2017, we redesigned the homepage for Education Services in order to make it easier for you to connect with hundreds of pages of free information and materials to support your Dharma practice. Come visit us and learn about all of the programs, prayers, practices, mantras, sutras, death and dying materials, and advice we make available. Recently, two Bhutanese singers, Pema Lhamo and Pema Samdrup, composed two tunes for the long life prayer for Lama Zopa Rinpoche spontaneously composed by Khadro-la (Rangjung Neljorma Khadro Namsel Drönme) in 2016. Lama Zopa Rinpoche enjoyed both tunes, and asked that their recordings be played at big retreats during break times or while students are waiting in the gompa. He also asked that both or either of these tunes be learned and used when offering the prayer. We are delighted to offer Rinpoche’s students these lovely tunes—with music or with guitar—and we hope that you will download and learn them for your own practice. Mandala July-December 2017 is published and making its way around the world! 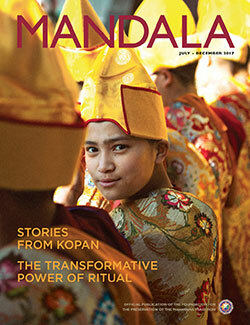 In the issue we share news from Kopan Monastery—where the seed of the FPMT organization first sprouted—including a story on the enthronement of Thubten Rigsel Rinpoche, the reincarnation of Kopan Monastery’s former abbot, the beloved Khensur Rinpoche Lama Lhundrup Rigsel; a report on the two Kopan nuns receiving their geshema degrees; and a look at the state of Buddhism in the Himalayas. We also explore the transformative power of ritual with a collection of pieces. Plus, teachings from Lama Yeshe, Lama Zopa Rinpoche, new photos, interviews and much more! Mandala is a benefit of the Friends of FPMT program. Copies are also available through the Foundation Store. We invite you to order a Merit Box to have on your home altar or elsewhere as an inspiring method to develop generosity by making offerings (however small) throughout the year. Merit Box offerings are collected once a year and turned into grants for Dharma projects around the world through the International Merit Box Project. Imagine your spare change being used to build a new statue, publish a new Dharma book, help others do retreat, and other Dharma activities! Click here to order your free Merit Box today. The Revolutionary Life of Freda Bedi: British Feminist, Indian Nationalist, Buddhist Nun is now available through the Foundation Store. Freda Bedi helped Tibetan refugees arriving in India in 1959, including the young Lama Zopa Rinpoche. FPMT centers, projects, and services have a special discount. Get it today and add it to your library! Read “Freda Bedi’s ‘Big’ Life: An Interview with Vicki Mackenzie,” Mandala’s online feature, to learn more. FPMT’s 15th International Sangha Day is on Chokhor Duchen (July 27). Please rejoice and make your center, project, or service’s annual donation to support the Sangha via the Lama Yeshe Sangha Fund on that day! Celebrate the Sangha on Chokhor Duchen, or, if more suitable for your community’s needs, choose another date. 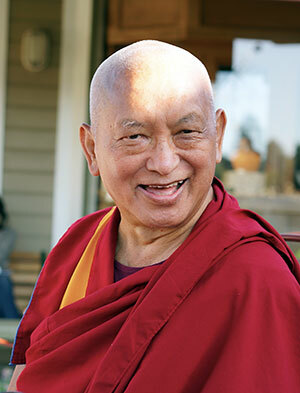 Donating to the IMI Sangha via the Lama Yeshe Sangha Fund is one of four annual contributions required of FPMT centers, projects, and services. Read about this and other policy and helpful guidelines in the Financial, Business and Fundraising Guidelines section. His Holiness the Dalai Lama being offered a mandala by Lama Zopa Rinpoche at the Jangchup Lamrim teachings, Tashi Lhunpo Monastery, India, December 2015. Photo by Rio Helmi/JCLRC. On July 6, the 82nd birthday of His Holiness the Dalai Lama was celebrated around the world by Tibetans and students of the Dharma. Lama Zopa Rinpoche is a devoted student of His Holiness and service to His Holiness is an important aim of the FPMT organization. 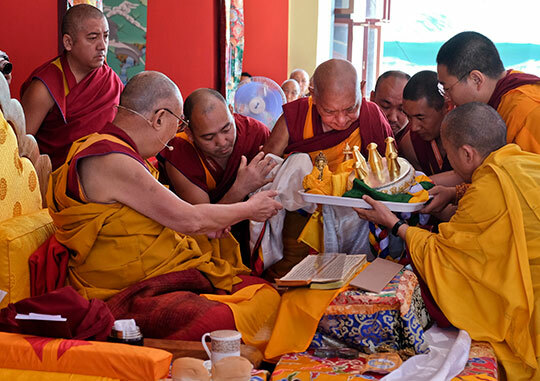 Many FPMT centers around the world held celebrations. 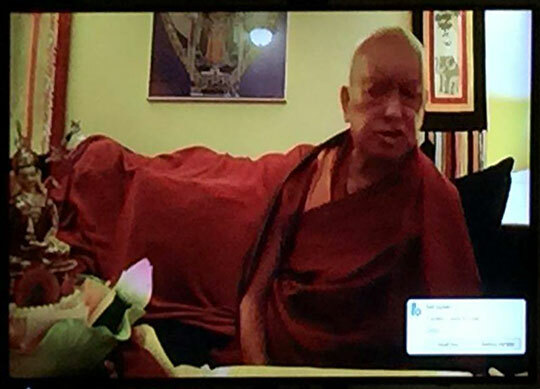 Lama Zopa Rinpoche sent two video messages that were played during the Guru Rinpoche bumtsog. Xavi Alongina passed away earlier this month. He created the FPMT publishing service, Ediciones Dharma, almost 35 years ago, the most prominent Spanish language Dharma publisher in the world. He will be missed by his family and his FPMT Dharma family. Would you like to spend your days in a really meaningful way? Have a look at the regularly updated meritorious opportunities to offer service as a volunteer or as paid staff in FPMT centers, projects, and services around the world. Mahamudra Centre, New Zealand, needs an operations manager, a housekeeper, cooks, and a groundsperson. 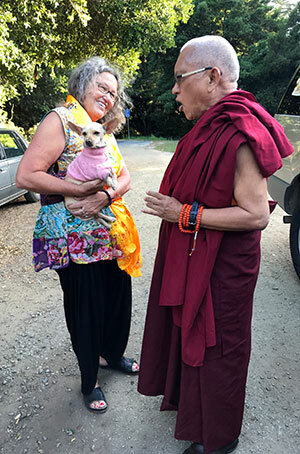 Lama Zopa Rinpoche reciting mantras and blessing Denice Macy and new rescue dog, California, USA, June 2017. Photo by Ven. Roger Kunsang. If you received this from someone else, or unformatted, visit our subscribe page to receive this newsletter directly. You can see that some people’s relationships are reasonable. Therefore, they last a long time. If people’s relationships start off extreme, how can they last? You know from the beginning they cannot last. Balance is so important.